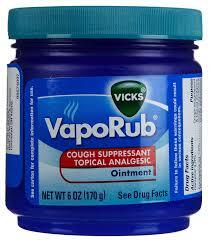 Vicks VapoRub ointment is a mentholated topical cream manufactured by Vicks. VapoRub is indicated for use on the chest & throat for cough suppression due to the common cold or on muscles & joints for minor aches and pains. Users of VapoRub often apply it immediately prior to sleep. VapoRub is currently manufactured and packaged in India and Mexico. In Germany it is sold under the name Wick VapoRub.